The SDGs, or Global Goals, continue to be such powerful and key highlights of global conversations these days. Especially at global gatherings like the United Nation General Assembly that was took place last week. And rightfully so — after all, that is what they are — Global Goals. One of the very interesting conversations that happened last week, was the We The Future summit convened by the Skoll Foundation and UN Foundation. 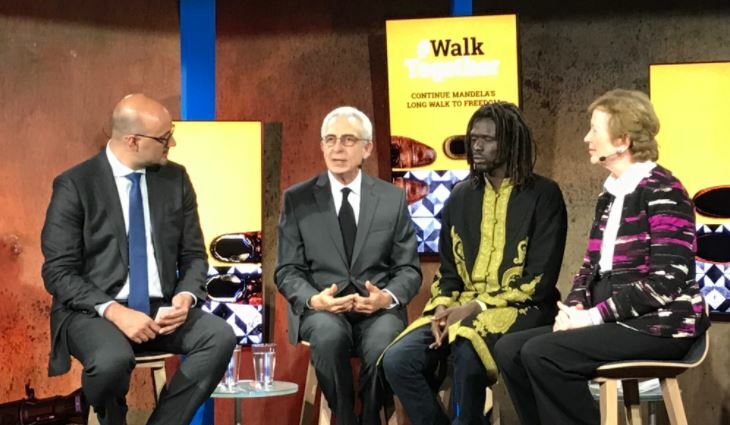 During the day’s deliberations and conversations there was a panel that looked at the “The Path Forward.” It had Former President of Mexico Ernesto Zedillo and Mary Robinson, the former president of Ireland. They were alongside legendary peace activist from South Sudan — Emmanuel Jal. The message was very clear: peace is essential if we want to achieve the Global Goals. “We need to elevate peace to a very special place in the Sustainable Development Goals. And understand that unless we can create a world where there is that sense of rule of law, of institutions and support of safety for the people, of security — on a very basic level, we are not going to get that development and human rights.” These were the words of Mary Robinson. “ It is crucial and I would like to see the indicators cross cut to really make it clear that rule of law and achievement of peace is fundamental to development, fundamental to justice, fundamental to all of these issues,” she went on to say. “For those who have the power and the force — we cannot free them from the responsibility. It is first and foremost a responsibility of those who have the capacity to fight, repress, and intimidate others. Sometimes in conflict situations the other party may have a good reason for doing what they do. But that is why it is important to remind those people how costly their actions are. And fortunately, humanity longtime ago invented two wonderful things: politics and diplomacy. Where conflicts have been solved it is because we have applied ourselves to use these wonderful instruments, which imply: commitment, responsibility and compromise.” He went on to give examples when politics and diplomacy have worked — The Iran Nuclear Deal and the recently reached peace agreement in Colombia. I think that our leaders have their work cut out for them as we work towards achieving the Global Goals. It is very clear that for the goals, development, and human rights to thrive — there has got to be peace. That peace — we have to work hard towards in our communities and our countries. Because we want to make the world a better place — we have got to put the work in, after all We are The Future.